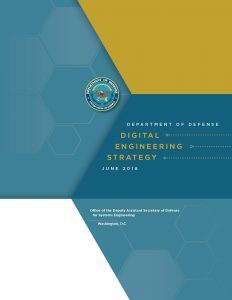 This DoD Digital Engineering Strategy outlines the Department’s five strategic goals for the digital engineering initiative. The goals promote the use of digital representations of systems and components and the use of digital artifacts as a technical means of communication across a diverse set of stakeholders. The strategy addresses a range of disciplines involved in the acquisition and procurement of national defense systems, and it encourages innovation in the way we build, test, field, and sustain our national defense systems and how we train and shape the workforce to use these practices.